Ballghazi: The five stages of Patriots fans’ grief. The five stages of Patriots fans’ Ballghazi grief. Photo illustration by Lisa Larson-Walker. Photos by Getty Images, Thinkstock, and Shutterstock. Since 2000, Boston has won eight professional sports championships, with each of its franchises winning at least one title during that run. That’s eight parades, eight trophies, eight banners, and eight times that there was tangible proof of what Boston fans already knew to be true: that we’re better than you. At the tip of the spear of Boston’s superiority complex are the New England Patriots. With six Super Bowl appearances in 15 years, the Pats have been dominant in an era of professional football specifically designed to prevent dominance. The result of Boston’s charmed sports existence, though, is that when things go wrong—like oh, I don’t know, a scandal involved the alleged deflation of game balls—Patriots fans don’t react like other fan bases would. (Here is a typically representative sample of our level of defensiveness.) Below is a look inside the mind of the average New England Patriots fan’s psyche over the course of the past week, based on a combination of personal experience and chatter from around the echo chamber that is #PatsNation. The balls were deflated? What does that even mean? Why would the Pats intentionally deflate the balls? Why risk it? And wouldn’t the refs notice if the balls were too soft, seeing as they handle them on literally every play? This seems like nothing. Let’s wait for the facts to come out. Who knows, maybe because the temperature dropped, that caused the ball to get softer. Someone’s checking on that, right? Seems possible. Yeah, this is nothing. It’s definitely nothing. On to Glendale. People are actually still talking about this? News flash, America, even in a hypothetical universe where the Patriots did deflate their game balls, they were switched out in the second half. What happened in the second half? Oh, right, just a 28–0 shellacking. Ball don’t lie, as the kids say. And what about LeGarrette Blount running roughshod over the Colts’ porous defense? Riddle me that, haters. Was that #DeflateGate-related? Why are we even talking about this? 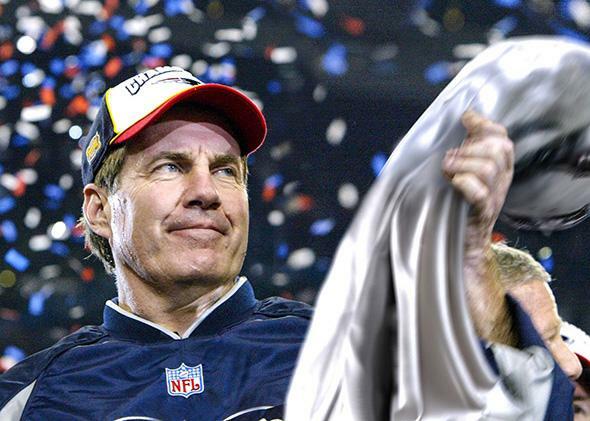 I’ll tell you why: the media’s hatred of Bill Belichick. And, obviously, the fact that everyone is jealous of the Pats’ decade and a half of dominance. Any other team, this blows over. But they hate us because they ain’t us, and now the good name of Thomas Edward Patrick Brady Jr. is getting dragged through the mud. You’re all acting like jealous, petulant children. Grow up so we can start talking about actual football, please. OK, seriously, this is absurd. Let’s say they did intentionally lower the PSI. Hell, let’s say it was Tom Brady, in the equipment room, with the pump. Does it matter? No, no it doesn’t. Literally everyone in the league does this. Aaron Rodgers likes to overinflate his balls. Brad Johnson admitted to tampering with his balls in the Super Bowl (which his Tampa Bay Bucs won, by the way—where’s the outrage about that, Mike Wilbon?). Eli Manning has the Giants’ equipment managers take months to break his balls in. Matt Leinart said on Twitter, and I quote, “Every team tampers with the footballs. Ask any Qb In the league, this is ridiculous! !” Agreed, Matt. Even players on the Colts are questioning why this is a story. Did Tom and Bill intentionally deflate the balls? Yeah, maybe. But who cares? We essentially got caught speeding. Write the ticket so we can move on, please, Goodell. And stop acting like we’ve sullied the game by driving 40 in a 35, everyone else. This is happening again? Seriously? After Spygate—and then David Tyree, and Brady’s knee, and Gronk’s everything, and Eli a second time—we can’t just enjoy this moment? Two more weeks of “Gate this” and “Ghazi that,” Belicheat, and every Bills and Jets fan coming out of the woodwork to do the trash-talking they haven’t been able to do in decades? Why does this keep happening to us? We should be talking about how this Patriots’ 15-year run, in the midst of the salary cap era, is the greatest in the history of the sport. We should be talking about how Tom Brady is the greatest quarterback to ever play the game. We should be talking about how Bill Belichick is one of the best coaches in the history of professional sports, period. We should be talking about those things because they’re all true. Period. End of story. But instead, we’re talking about deflated footballs, cheating, and asterisks? Dammit. It’s just not fair. You know what? Fine. They did it, and you love it, because now the Patriots are the scheming, cheating empire of evil that you always thought they were. We’re cool with the Patriots cheating (although honestly, a little gamesmanship with the footballs isn’t cheating, but whatever), and we’re cool with you talking incessantly about what cheating cheaters they are. So go ahead, fill up the tanks of the #hottake machines. Keep pouring on the calls for Belichick’s head, the Darth Vader cracks, and the “Tom likes soft balls” jokes. The hate fire fuels us. There are three certainties in life: death, taxes, and the fact that an Angry Tom Brady morphs into a merciless assassin—a superhuman, superhandsome, pigskin-chucking ninja. After two weeks of How does this affect your legacy, Tom? questions, The Best Quarterback of All Time will strap up next Sunday with one goal in mind: to shred Richard Sherman and the vaunted Seahawks’ secondary in the most inhumane way possible. So yeah, we’re OK with that reality. We’re at peace with all of it. Really. I mean, unless we lose. In which case, this was all clearly an anti-Pats conspiracy drudged up to take our eyes of the prize. For that, you guys can all go screw yourselves. Correction, Jan. 23, 2015: Due to a production error, the caption of this article’s photo illustration originally misidentified the Vince Lombardi Trophy as the Heisman Trophy.